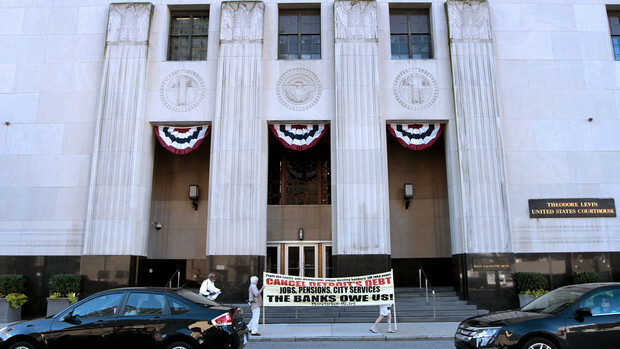 At the bankruptcy hearing on Friday, January 3, 2014, Emergency Manager Orr admitted that the City of Detroit could have pursued claims for fraud, unjust enrichment, and breach of contract against Bank of America and UBS to potentially recover the $300 million these banks have already netted from their interest rate swap swindle. However, instead of going after these banks for their predatory lending practices which caused Detroit’s financial crisis by foreclosing on 100,000 homes and then putting the city in bankruptcy through interest rate swaps which continued the banks’ fraudulent lending practices against the city itself — Orr is asking Judge Rhodes to approve a termination fee of an additional $165 payment to these banks, funded by a loan by Barclays Bank at up to 8.5% interest with $4.2 million in “breakage fees”. If this deal is approved, the people of Detroit will be paying 20% of city income tax revenues, $48 million a year, to these banks for the next four years, at the expense of city pensions, jobs and services. Pack the hearing on Monday. Let’s send a message to Judge Rhodes to reject this gift to the banks. Cancel the debt to the banks. The banks owe us for the destruction they caused. Make the banks pay to rebuild our communities and put our youth to work. Recuse Detroit Bankruptcy Judge Rhodes, Mediator Rosen, EM Orr from the city’s future! Abolish the EM law!